The Taj Mahal, the pyramids at Giza and the Great Wall of China. For most of us, these tourist destinations are places to visit and capture forever with a photograph before moving on. 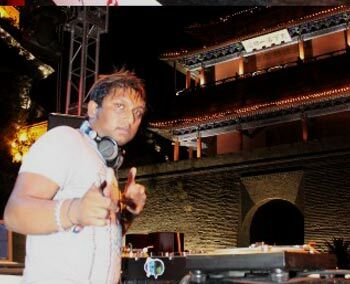 For 29-year-old Mumbai-based DJ Praveen Nair, such world wonders have become his stage. "I've performed in Egypt with the pyramids in Giza serving as my backdrop. It was a wicked experience. I've played at the Great Wall of China, at the Taj Mahal, at the Leaning Tower of Piza in Italy. It's amazing. You see these places on television and in pictures, but it doesn't compare to actually being there and making music," he says. 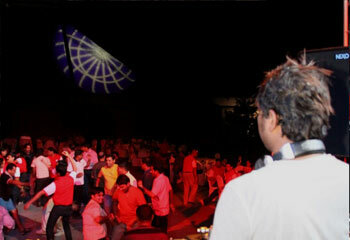 Welcome to the life of a professional international disc jockey, the life Praveen has lived for seven years. A life that has taken him all over the world to perform: China, Italy, Australia, Egypt, Malaysia, Thailand, Singapore, Turkey, Dubai and more. "It's a very, very rewarding career. The best part is all the travelling," he explains. "You get to meet so many new and exciting people, even on an ordinary day. You're flying all over the world, all over the country. You get to hear new music, eat different cuisine and see different cultures. Honestly, my work has really changed my outlook on the world. It's taught me a lot." While it's a life Praveen 'would never trade for any other', it's quite a far cry from what you would expect for a person with his qualifications. A Mumbai native, Praveen studied electrical engineering with a specialisation in instrumentation engineering at one of the city's universities. 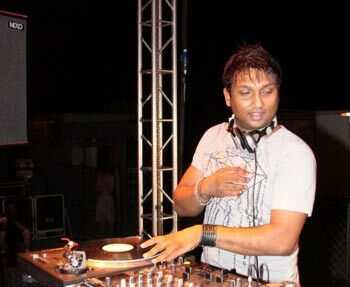 But, Praveen explains, even during his college years, he began to harbour dreams of becoming a DJ, a profession he was instinctively attracted to. "When I was doing my college studies, I got the idea of becoming a DJ. Just listening to music on the radio by myself or with friends, I would hear that transition from one song to another one, and I always thought it was really cool. The idea of it has always appealed to me. From that time, I've always been attracted to it and have pursued it." So while finishing up his engineering studies, Praveen enrolled in DJ school for a year. Later, armed with his own equipment and a passion for the profession, he began to hone and refine his skills. After hanging out in clubs and becoming well acclimated to the insider music scene in Mumbai, Praveen was ready. "My first gig, I played at a War of the DJs in Mumbai. It was crazy, a really big competition. I was nervous, but I ended up finishing in the top seven for the city, so that really motivated me. I knew I could do this. I started playing at clubs all around the city, then pretty soon I started playing all over the country. Then I started playing international gigs," he remembers. From that point, Praveen has never looked back. He recently released Burn D' Dance Floor, his first album, which contains three original tracks and six remixes. He also has a weekly show on Mumbai's Fever 104.3 radio station, called Saturday Night Fever with DJ Praveen Nair, from 9 pm to midnight. "I describe my style as funky and bouncy," he says. "In one word, I'd say it's happy music. That's what I try to make." As for his original tracks, according to Praveen, creating content out of thin air is all about inspiration. "Since I'm always travelling, whenever an idea comes to me, I record it on my mobile. Then when I get back to my studio, I try to recreate and elaborate on that idea using my equipment." And while he's always excited about the international music scene, these days he's seeing India's deejaying community grow by leaps and bounds. 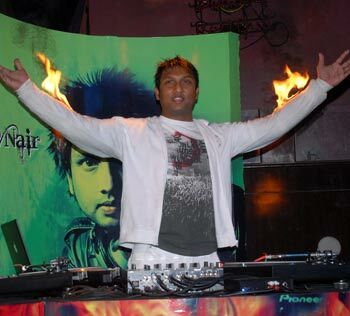 "I'm 100 per cent certain, without doubt, that interest in deejaying is growing in India. Over the last three or four years, I've been impressed by how many people are getting involved with it." To aid this community of fledgling music-spinners, Praveen offers a piece of advice. "If you want to become a DJ, the first thing you need is thorough knowledge of music. You need to know about different genres and styles. You have to be familiar with many different artists. After that, it really helps to have you own equipment, because the only way to become a good DJ is to practice day and night," he explains. As for the downside of the profession, it's difficult to get anything out of Praveen. "There's no downside as such. It's a bit hectic. But if it's right for you, you'll absolutely love it. I guess the worst thing is that you get jet-legged very frequently, because you're always flying. Also the schedule can be really tight sometimes, and pretty exhausting. You don't get to spend too much time with yourself." On talk that deejaying and the so-called trance scene in Mumbai are inherently connected to illegal drug usage and heavy drinking, Praveen is incredulous. "There's a very incorrect and unfair linkage between the culture of deejaying and this type of music and the culture of drugs and drinking. That's not what we're about. I'm a teetotaller. I do not smoke, I do not drink and I obviously do not do drugs. I get high on the music. That's what this is all about. People who are serious about the music are not doing any of those things." As for salary, Praveen explains that deejaying is like other professions in the music industry. "If you're good, you will likely do well. You have to work really hard and be passion about it. You have to be committed. But you can make money definitely. For example, I do nothing else. I'm a professional DJ."